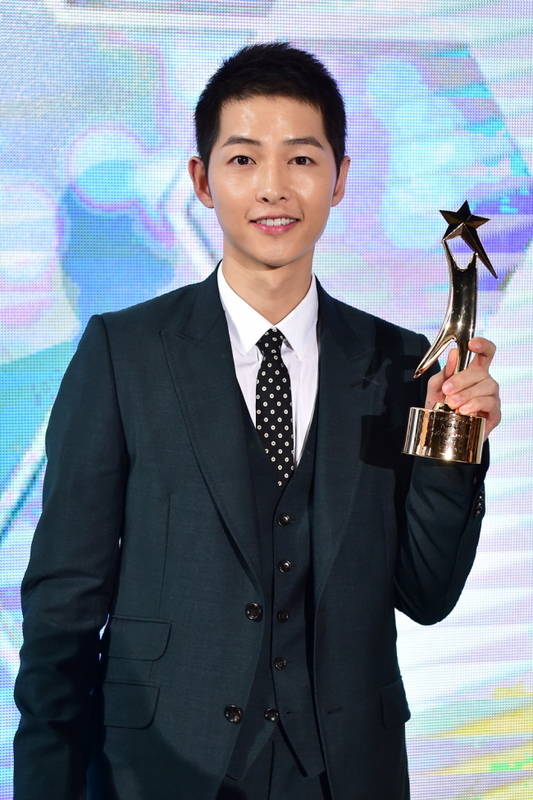 Actor Song Joong-ki nabbed the grand prize for his lead role in the KBS2 drama series “Descendant of the Sun,” which aired early this year to explosive pan-Asian popularity, at the Asia Pacific Actors Network Star Awards on Sunday. “I don’t know what to say, it’s the first time I’ve received such a big prize,” Song said in his acceptance speech at the ceremony, held at broadcasting network MBC’s headquarters in Sangam-dong, Seoul. The APAN awards, hosted by MBC and the Korea Entertainment Management Association, celebrates drama series from all Korean TV networks. Song also received the best couple award with fellow “Descendants” lead Song Hye-kyo and the best Asia-Pacific star award alongside Korean actress Kim Hee-sun, Thai actress Tanayong Wongtrakul, Indonesian actor Joe Taslim, Filipino actress Jessy Mendiola and Japanese actor Narimiya Hiroki. Other award recipients include Park Bo-gum and Kim Yoo-jung, currently starring in KBS2’s “Love in the Moonlight,” for best new actor and actress, respectively. Lee Byung-hun received the global star award. Han Hyo-joo (“W”) and Cho Jin-woong (“Signal”) took home awards for best actor and actress. The awards ceremony was part of the Digital Media City Festival, which is organized by MBC and celebrates hallyu media contents. It runs from Oct. 1-11.